If you are short of time, the answers to the following 3 questions should let you know all you need to about the Pro 1000. If we have missed something, let us know in the comments. If you want more detail, you can read our full Oral-B Pro 1000 review further down the page or watch our video review. No, this is a fantastic budget electric toothbrush. This is more about practicality and function. It gives most of the basics you need of an electric toothbrush. It does not have lots of cleaning modes, or lots of extra features, you need to spend more to get this. The Pro 1000 is an excellent toothbrush. The Sonicare ProtectiveClean 4100 is a little more expensive, with a larger brush head, but boasts a better battery life, pressure sensor and brush head replacement reminder system. If you like the efficiency with which Oral-B brushes clean, you could to consider the Pro 6000. It adds a few more features, including Bluetooth connectivity and an improved battery life. If you’re shopping within this price range, you may also like to check out our recommendation for best budget toothbrush. 3. Where is the best place to buy the Pro 1000? You can pick the Pro 1000 up from a variety of places. We have listed a variety of online retailers and their prices below, and it’s always worth checking out eBay, too. Prices can vary, but typically we find online retailers offer the best prices. The Pro 1000 is a budget/entry level brush. There are much more capable and feature rich brushes available. However, these are by no means essential and the 1000 offers a lovely balance of features for the price. Within the Oral-B range at the time of writing there is the Vitality and Pro 500 electric toothbrushes. Whilst ok and do offer some of the benefits of an electric toothbrush, I do not feel that they really offer what should be considered essential in an electric brush. Most importantly they do not have a quadpacer which is very useful. There are potentially different versions of this brush. In most cases the difference is only the colour of the brush handle, specifically the rubber grip that runs down the middle of the handle. This is either Black or White. It is possible that Pink or Blue versions are available. The other potential difference, although not as common is the brush head that is included with it. Normally it is the CrossAction brush head, but some variants may come with a Pro White or Sensitive brush head. In most instances the brush is sold with a White or Black rubber grip and with a CrossAction brush head. Here are what I consider to be the pros and cons of the Pro 1000. Design – Slim and lightweight, it feels good in the hand and well placed grips make it easy to hold. 1 cleaning mode – No nonsense get the job done approach. Battery life/status – It would be nice if the battery lasted a little longer than the 7 days and it would be better if there was more feedback from the brush on how much power remains in the battery. Get a red flashing light when low, but nothing more really. Box contents – The inclusion of an extra brush head or travel case would be appreciated. Made by one of the leading brands within the dental health space the Pro 1000 from Oral-B is a real pleasure to use everyday. Starting first with the design, the Pro 1000 is slim and lightweight in the hand. Made up of two parts, you have the brush handle and the detachable brush head. The handle is what contains the battery, motor and other high tech stuff that allows the brush to perform so well. Whilst not a perfect cylinder shape it is curved and feels good to hold and it is not heavy. This makes it nice and easy to maneuver around the mouth and clean your teeth properly. This also helps for older children who may use this brush or seniors who may not have the same dexterity that they once had. Running down the front of the brush handle is a rubber grip that is either Black or White in colour (subject to variant). This grip not only accents the brush but proves really useful in stopping the brush slipping out of the hand, particularly when wet. The rest of the handle is made from a smooth to touch gloss white plastic. So, as you will see in the images, I am reviewing the Black colour option here. You can see a nice Black and White colour contrast. One the White coloured unit, the White rubber grip blends into the plastic body a little more so it looks all White. Whilst the majority of the plastic body is smooth, an extra touch on the Pro 1000 is that on the upper rear of the handle are a series of ridges formed from plastic. They give an extra grippy surface and are not essential, but a welcome addition. It is on the front of the brush handle where the main controls are. A fairly simple setup, in the upper third of the brush handle is the power button that had a nice feedback to it. Press it once to turn the brush on and activate the one cleaning mode, named Daily Clean. Press it once more to turn the brush off. On both the Black of White handle the power button is White in colour with a power icon on it. However, it is much more prominent on the Black handle as it contrasts with the Black. The transparent icons light up when on charge or when the battery is low. This is where one of the small criticisms of this brush comes in. The upper charging icon lights up Red when the battery is low whilst the battery icon will flash Green when on charge. For me, I would like to see more feedback from the battery. For example when the brush is turned off, the battery icon stays lit for 10 seconds, green to show a good amount of power in the battery, yellow for medium and red for low, but sadly this is not the case. The charging stand has a small prong on it that the 1000 brush handle sits on. Maybe you expected this, but the handle is completely sealed, meaning it is waterproof. Now this does mean it can be used in the shower and can safely be rinsed under the tap to clean it off. I strongly advise submerging the brush in water and the charging stand is not waterproof. Brush heads simply push on and pull off the handle, you will hear it click into place. Provided with a CrossAction brush head, this is the ‘standard’ brush head Oral-B provide with their brushes. It has been designed to offer a good general clean to the teeth and gums. Oral-B’s studies have shown that they can remove up to 300% more plaque from the gumline compared to a manual brush. Plaque at the gumline is the cause of gum disease, something none of us want. If your gums are red and swollen and bleeding, this is likely as a result of plaque buildup and the early stages of gum disease. Thankfully gum disease to a point is reversible and the Pro 1000 can really help make your teeth and gums healthier. Sold separately, any of the above will fit onto the brush and work with the Daily Clean mode offered on the brush. All official Oral-B heads have these fading bristles. Other brands may not, so be aware of this, if not buying manufacturer originals. When the power button is pressed, the brush head begins moving automatically, this is the Daily Clean mode that lasts for a total of 2 minutes. 2 minutes is the dentist recommended brushing time, you should do this twice a day. To help make sure you brush for the right amount of time, the Pro 1000 has a timer built in. It also has a quadpacer. This breaks the 120 second cleaning cycle down into 4 x 30 second chunks. You should Imagine your mouth broken up into 4 sections. Upper right, upper left, lower right and lower left. The idea is that you spend 30 seconds cleaning each section. The pacer helps you keep an even brushing time on these 4 sections. At the 30 second intervals the brush will provide an audible warning via a slight pause in the brush motor. This is your cue to change quadrant. Once the 2 minutes are up 3 brief pauses in the brush motor will be heard and felt. The brush will continue to run at the end of the 2 minutes, you then need to turn it off, it will not do this automatically. I really like the clean that the Oral-B brushes offer. The 3D movement really works the teeth and gums sweeping away plaque and debris from for a cleaner and fresher mouth. If you are not used to an electric toothbrush or have used a Colgate or Sonicare brush, you might find the clean of the 1000 a bit harsher. It feels a bit more firm than other brands but I like it. Now do not get too caught up on this point, but the motor in the 1000 is not as powerful as some of the more premium models. The most expensive models have a more powerful motor which means there are more movements per minute. But, the reality is unless using 2 different brushes side by side you will struggle to tell. Even if you did it is hard to notice. As important as cleaning regularly is ensuring you use the right technique. You do not brush the teeth with an electric toothbrush like you would with a manual brush. You move slowly from tooth to tooth, rather than rapidly back and forth. Be sure to consult the manual or other guides on how best to use the brush. Now something that is promoted in the marketing material by Oral-B is a pressure sensor. There is some confusion though because although there is a pressure sensor built in, it is not setup in quite the same way as it is on other brushes. Brushing too hard is one of the biggest causes of gum recession. The bristles of a brush need only skim the surface of the teeth. Think sweep rather than scrub. Inside the handle of the 1000 is a pressure sensor that will reduce the power of the motor when it detects the user is pressing too hard. Once the pressure is relieved the motor increases in speed and goes back to full power. The pressure sensor is therefore a safety mechanism, but the reason the confusion exists is because on other brushes there is a light on the back of the handle that alerts you, the Pro 1000 does not have this. If you listen, there will be a change in the sound emitted from the Pro 1000 when brushing too hard, that is the motor adjusting. I do agree the light would be more useful, but you need one of the more premium models to have this. When running the brush does produce a vibration through the handle and a sound as do all electronic toothbrushes. The Pro 1000 has a bit more of a mechanical sound and is a bit louder than Sonicare models which tend to be quieter but produce more vibration in the hand. The box contents is limited on the 1000, you have the brush handle, the brush head, the charging stand and the documentation, that is it. However this is all you need. As is standard the 1000 comes with a 2 year/24 month warranty. Providing any fault in this period is not as a result of user damage then it should be repaired or replaced at no cost to you. Just a week’s worth of battery life is what you get from the Oral-B Pro 1000 according to Oral-B. This equates to 28 minutes of cleaning time which equates to 7 days of usage, based on 1 user brushing their teeth twice a day for 2 minutes. This is what we had expected based on other Oral-B brushes of this type, but in our testing, with a fully charged brush we got you 48 minutes of cleaning time. This equates to 12 days of usage, based on 1 user brushing their teeth twice a day for 2 minutes. We were not expecting this and you may not quite get as much as this (it’s not normal based on all the handles we have tested), maybe we got a bit lucky here, but it is fair to expect a minimum of a week and possible a few extra days! Supplied with the brush is a charging stand supporting 110-130V. When not in use it is perfectly safe to leave the brush sat on this stand and on charge. A full charge can take upto 15 hours. It is however perfectly fine to take it off charge sooner as it is fine to leave the brush on the stand. For most this battery life is just fine, but competing brands generally outperform Oral-B with normally 2 weeks or more from their brushes. I won’t hid from the fact that a basic manual toothbrush will cost just a couple of dollars, but what we have here is considerably more expensive. However the results and benefits it brings in my mind make this a very worthwhile investment. Not only can you achieve a better clean you also take away a lot of the effort involved. The Pro 1000 has a retail price of around $70. Good news though, you can generally pick this up for a bit cheaper! The level of discount varies, but on average the selling price of the Pro 1000 is around $40-50 ($45 average). So that is $30-40 off the price. We have listed a variety of buying options here. Ultimately the brush is only worth what you are prepared to pay for it, but given the other options out there and all the other brushes I have used, this is most certainly fair. Whilst the prices are always changing, it is the White coloured brush handle that appears to be the cheapest, most often, so if you want to the Black coloured handle you may need to pay a few Dollars extra. This brush like every other requires replacement brush heads for each user every 3 months. Replacement heads can be purchased in packs of differing sizes. Normally, the price per brush head gets lower the more you buy. As a guide the cost per head is around $5. A pack of 3 will often cost $15 but can be prices higher, subject ot where you buy them from. Therefore using the average cost (based on one user) over 3 years, the Pro 1000 will cost $100 or $0.09 per day to own. Oral-B have developed a pretty strong reliability over the years they have been making brushes and we find the failure rate to be low. Whether this is your first, second, third or fourth electric toothbrush, it is a brilliant product that does the job you would expect of it. It cleans the teeth well. It is slim and lightweight in hand and easy to hold. The battery life could be better, but for the price its ok.
No, a travel case or more premium features are not included, but for most of us who need or want an electric toothbrush this does all we require perfectly well. The built in timer and pacer really encourage brushing for the right amount of time and ensure you have cleaner and healthier teeth you and your dentist can be proud of. Is the Pro 1000 an oscillating brush? No, it has just one cleaning mode Daily Clean. For more cleaning modes consider the Pro 3000, 5000 & 7000, or see our explainer on Oral-B cleaning modes. The brush head that is supplied will depend on the version purchase. The Pro 1000 is sold with a Cross Action, Floss Action or 3D White head option in the box. Irrespective of which one you purchase you can change the heads with any others on offer from Oral-B. There are many that work with the brush handle. There are 6 main brush head options that include Cross Action, Floss Action, Pro White/3D White, Sensitive, Precision Clean and Deep Sweep/TriZone. Does the Pro 1000 have Bluetooth? Does the Pro 1000 come with a warranty & how long is it? If purchased new from an approved retailer the Pro 1000 will come with a 2 year warranty. Does the Pro 1000 have a built in timer? No, the Pro 1000 does not have a wireless smart guide included. Consider the Pro 7000 for this. Yes, a charging station is included with the Pro 1000. The Pro 1000 charging station or brush head holder has not been designed to be fixed to a wall. Can I use the Pro 1000 in the shower? Yes, you can. The brush is water resistant. Avoid prolonged immersion and do not leave the brush sat in water. No, a travel case is not included. 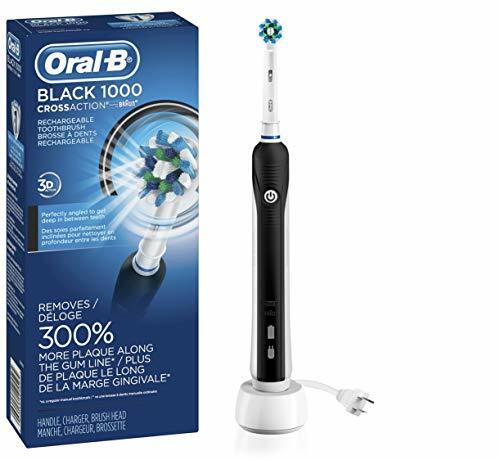 Do you own or have you used the Oral-B Pro 1000?